It has been unseasonally cold this August in Germany and I had a feeling that plums, peaches and ripe tomatoes were very soon replaced by the first pumpkins, chestnuts and chanterelles, which appear to be in season very early this year. Since I LOVE pumpkin and am waiting all year round for it to be available again – for in Germany one cannot find butternut squash all year round like in the UK (it’s the same with kale, which I’m craving all year long until it’s making a very short appearance …but than again, this is what it means to cook along the seasons – so I’m not complaining) – I decided to make the best of it and made a dish with an earthy, comforting pumpkin purée that’s perfect for chilly days. 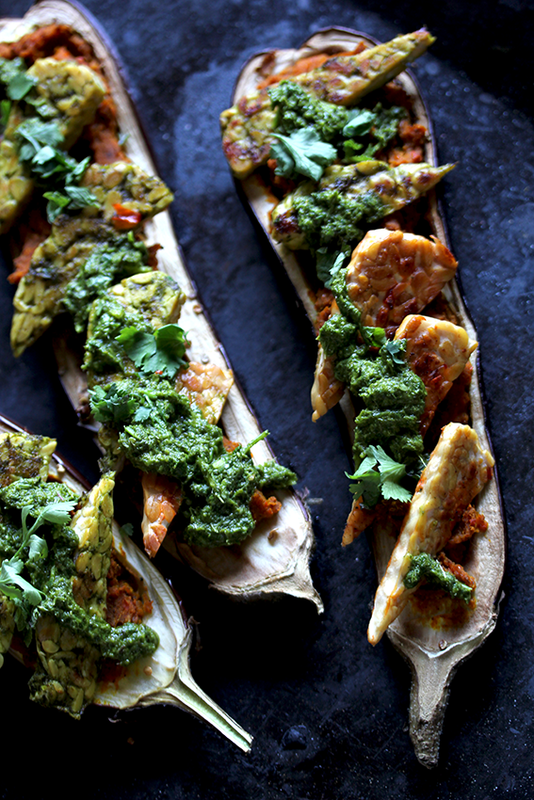 I teamed it up with last bits of summer: beautiful aubergines and gave it a fresh twist with the coriander-mint-chimichurri. I also wanted to finally post a recipe with an ingredient that I learned to love in the course of this year, when I was still eating vegan and was looking a little deeper into the soy ‘issue’. Tempeh! If you haven’t tried it yet – this is definitely something you shouldn’t miss. I’ve seen it making an appearance in some organic grocery stores lately, but there it’s very expensive. I am buying it in Asian grocery shops, where it costs a fraction – just make sure non-GMO soy beans are used. Why is tempeh so great? Well, first of all because it tastes so good! Unlike tofu, tempeh has a very nice taste of its own – I find it quite nutty – as well as a great texture. Originally from Indonesia, tempeh are whole soybeans mixed with rice flour, fermented by a bacteria culture that binds the beans into a firm ‘cake’. The fermentation is the important part, for soybeans contain a very high amount not only of enzyme inhibitors, but especially of phytic acids, that cannot be broken down by soaking and cooking alone. Yet fermentation does the trick (miso is another example for such a fermented soy product). I like tempeh best sliced or cut into chunks, marinated with a little soy sauce, chili and fresh ginger and then fried – its great with something fresh such as cucumbers and coriander. Roast cumin, cardamom and coriander seeds and allspice in a pan without oil and ground them with a mortar and pestle. Preheat the oven to 220 °C. Wash the pumpkin (if using Hokkaido, you don’t have to peel it), dice it and mix it in a bowl with coconut oil, grounded spices, cinnamon, nutmeg and a generous amount of sea salt. Place on a baking tray and roast in the oven until soft. Meanwhile, slice the tempeh and marinate it with tamari and chili. In fact I made two marinates: the other one being the chimichurri, which gave the tempeh more freshness due to the lime. Cut the aubergines lengthwise and scoop out the interior (Don’t throw it away! It’s great for pasta sauces.). Slightly season the aubergine’s inside with salt and black pepper. Remove the pumpkin from the oven and purée it with a hand held blender. You might want to add a little water or stock, for it must not be to dry since there is no other sauce in which the aubergine boats are braised. Fill the purée in the aubergine halves and place either in a casserole with a lid or on a baking try covering the aubergines with tin foil. Bake in the oven at ca. 180°C for about 20-30 minutes until the aubergines’ flesh becomes mushy. For the chimichurri blend the herbs with the lime juice, oil and a little salt. Add a little water if you want it to be a bit thinner. I actually served the aubergines on a bed of the sauce – this might be a bit to flavorful for some – you could serve them on wilted spinach, chard or with a salad. Roast sesame seeds in a pan and set aside, then heat coconut oil in that pan and fry the tempeh slices until crispy and golden. 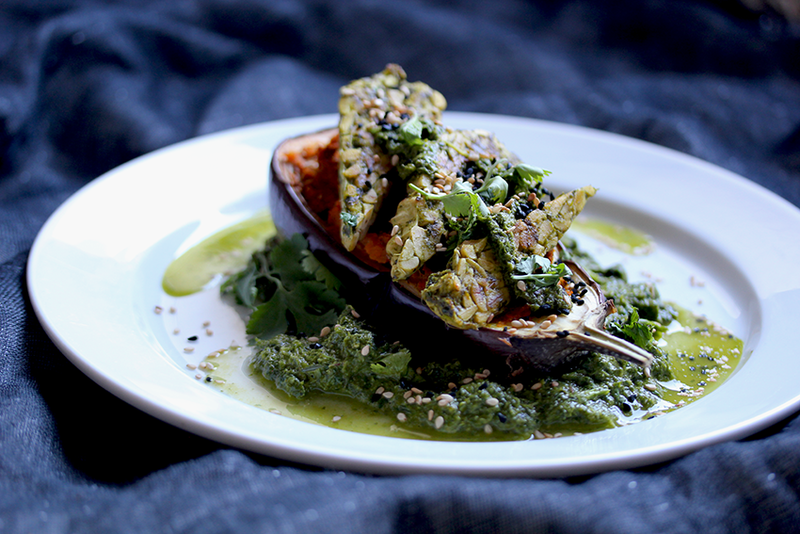 Generously spoon the chimichurri on the pumpkin, top with the tempeh and sprinkle with herbs and sesame seeds.